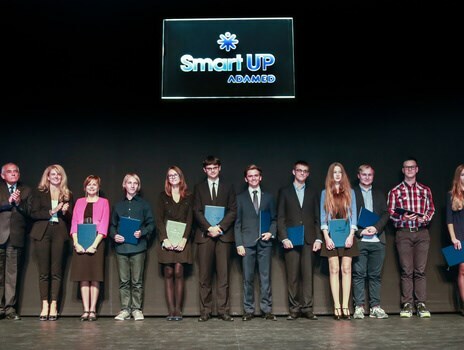 The laureates of the grand prize of the 1st edition of ADAMED SmartUP – Maksymilian Głowacki and Aleksandra Janowska – took, respectively, first and second place in the preliminaries for the European Youth Debating Competition – an international competition that promotes factual and cultured debate on scientific issues. 50 students from 15 secondary schools in Warsaw, Płock and Włocławek entered the preliminary competition. During an Oxford-style debate, the participants discussed whether the future of technology and industry is possible without fuels and plastic. The supporters and the opponents of the thesis put forward both the arguments in favour of the role that plastic has in the development of civilisation, for example in areas such as transport, the building industry or medicine, and the arguments that indicated specific problems triggered by plastic waste. Members of the jury, which consisted of industry, science, non-governmental organisations and media representatives, followed the debate closely. After internal deliberation, they selected the winners of the Polish edition of the competition. The prize for winning the Polish edition of EYDC is taking part in the final debate that will be held in October in Budapest. Maksymilian and Aleksandra, together with debate-winners from eight other countries, will discuss issues related to the future of technology, the chemical industry and plastic. EYDC is organised by The European Petrochemical Association and PlasticsEurope in cooperation with Young Leaders.